Are you on the lookout for an easier take and go lunch idea, but tired of the traditional brown bag options? 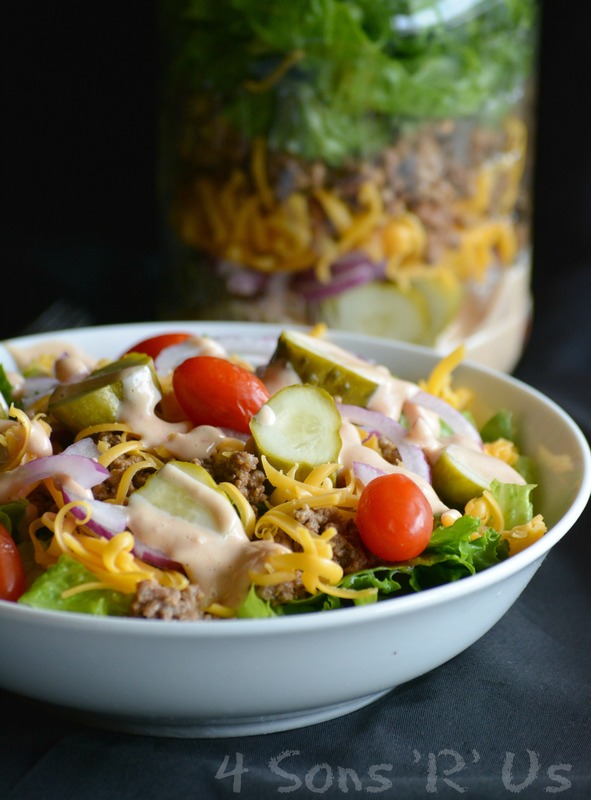 This Cheeseburger Mason Jar Salad is hearty, healthier, and let’s face it tastier than many alternatives. Stacked full of fresh ingredients it delivers 100% on the flavor you’re craving, minus all the grease, carbs, and calories. My husband and I take on fairly traditional roles in our marriage. For us, it works. I realize it’s not everyone’s cup of tea, but with out family’s dynamic and based on the needs of or children, it’s what’s best for us at this stage of the game. He goes to work every morning, often before the sun’s even up. I get the luxury of sleeping in until the kids get up for school and being able to stay in the comfort of my own home during the day and generally dictate my own schedule. On my part, I try to make his days easier by having a yummy lunch packed and ready for him to grab and go in the mornings when he’s walking out the door. For some unknown reason, this is hard for me. Like I actually have to think and struggle to come up with ideas to keep it fresh and exciting. Not to mention remembering to make it before I go to bed. I also have to keep in mind what’s socially ‘acceptable’ to be seen on a testosterone fueled job site, almost none of which have a microwave. The first time I packed him a salad in a jar, he got to hear all about his ‘greens; from the other guys. That all stopped when they saw what all was actually in said salad. There was no weight watching, or bird food for my hungry husband who had to work all day. From what he said, they were all pretty jealous of his portable deconstructed cheeseburger in a jar. All the standard fixings, not need to heat before you eat. Grab your fork, give it s stir, and go to town. Even better for job site eating? Screw the lid back on when you’re done with the fork inside the jar and it’s no mess, no clean up that he can just throw in the sink when he gets home. Leafy greens, thin strips of red onion, cherry tomatoes, seasoned ground beef, and cheddar cheese make up the majority of this hearty meal in a jar. Sliced dill pickles and a thick and creamy thousand island dressing tie all the flavors together into an actual meal that can serve as dinner or a lunch that really packs a punch on the go. 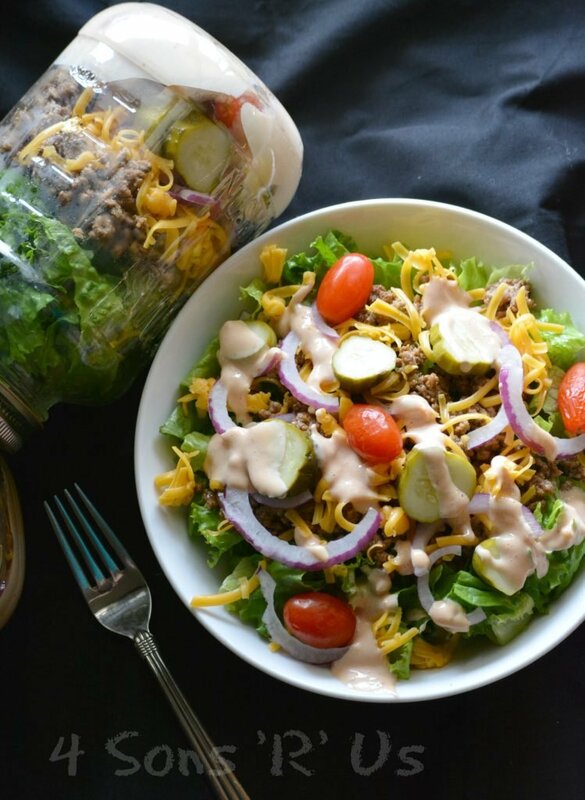 Don’t think you have to go the fast food route, even on the job– a Cheeseburger Mason Jar Salad is the way to go to get all the flavor you want without any greasy calories. 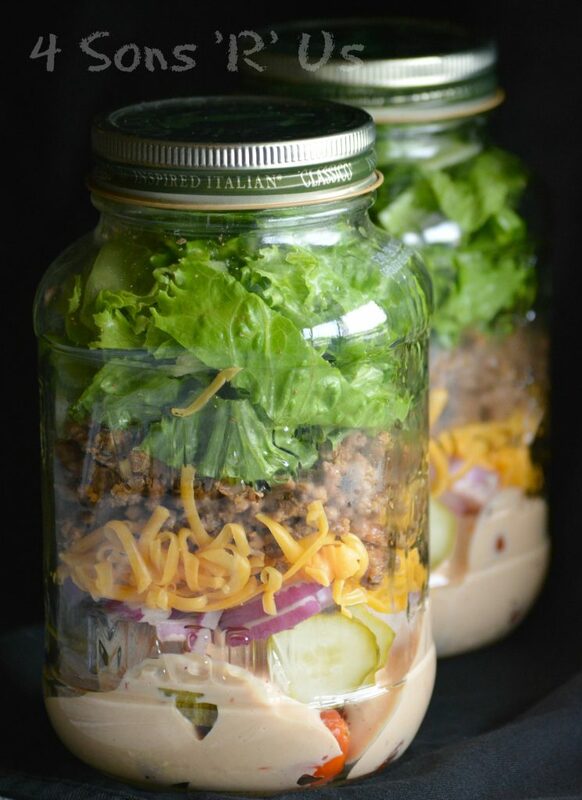 A hearty salad in a jar that's easy to grab for an on the go meal that delivers all the fabulous cheeseburger flavor you love in each lighter bite. In a large skillet over medium heat, brown the ground beef until fully cooked. Strain the grease from the meat and return it to the skillet and heat. Stir the ketchup and mustard into the beef. Lower the heat and cook, continuing to stir, until the mixture's warmed through. Remove the skillet from heat and allow it to cool. Starting with the dressing, layer the ingredients equally into two mason jars. 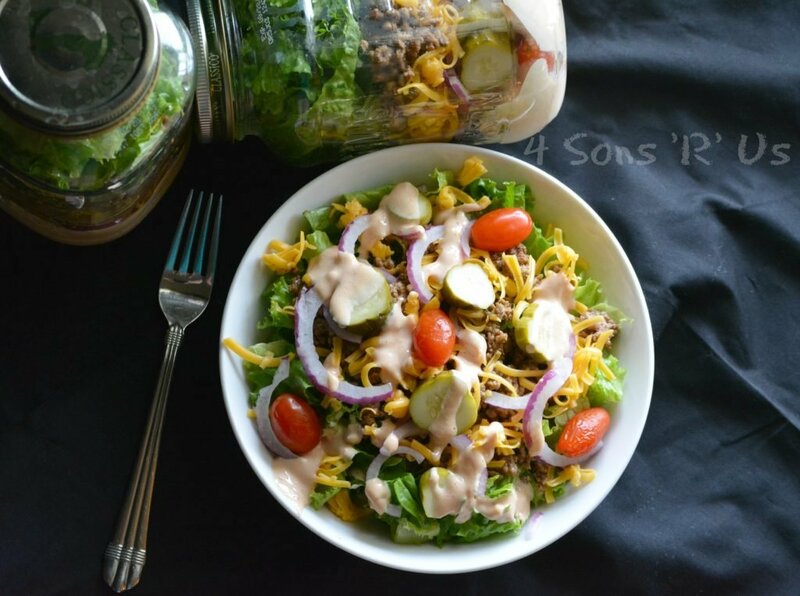 Follow the desired amount of dressing with the tomatoes, pickles, onions, cheese, cooled beef mixture and finally with the lettuce. Seal the mason jars and store in refrigerator for up to 4 days. What a fun grab and go lunch! I need to be better about packing my work lunches when I’m on road and this looks like a perfect option! This would fit the bill nicely! This is such a great idea for a grab and go lunch. It looks delicious and healthy, too. Thanks for sharing at Fiesta Friday! You summed it up perfectly, Natalie!